In almost anything you read about Romania two names crop up again and again. 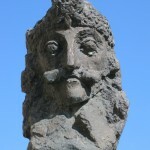 The first is Vlad Ţepeş (1431 - 1476), also known as the Vlad the Impaler and the figure on which Bram Stoker's Dracula was based. There is no doubt that Vlad was a very unpleasant person, who enjoyed torturing people, but no evidence that he was actually a vampire. The second notable character is Nicolae Ceauşescu, who together with his wife Elena, ruled Romania as a dictator from 1965 to 1989. He established a Communist regime and instituted many unpopular reforms, leading eventually to a violent revolution in which the couple were both executed by a firing squad. Like most dictators, Ceauşescu lived in fear of being invaded by foreign forces, and as part of his defence strategy he built a road over the Fărăgaş Mountains, some distance north of Bucharest, so that he could move his troops quickly in that direction if necessary. It took the army 4½ years to build the road, at a cost of 38 soldiers' lives and it was finally opened in 1974. In recent times it has become well known amongst motoring enthusiasts as a driving challenge, especially since it was featured in 2010 on the BBC Top Gear programme, when Jeremy Clarkson described it as "the best driving road in the world". 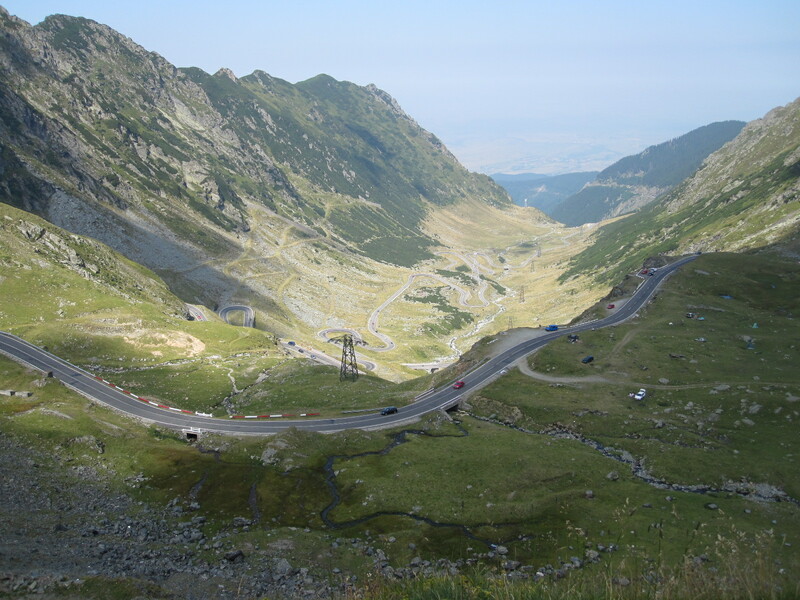 It was my desire to drive this spectacular route, now known as the Transfăgărăşan Highway, that caused me to go to Romania. As it is normally closed from October to May, and occasionally during bad weather in the remaining months, I decided to go in August when it was most likely to be open. 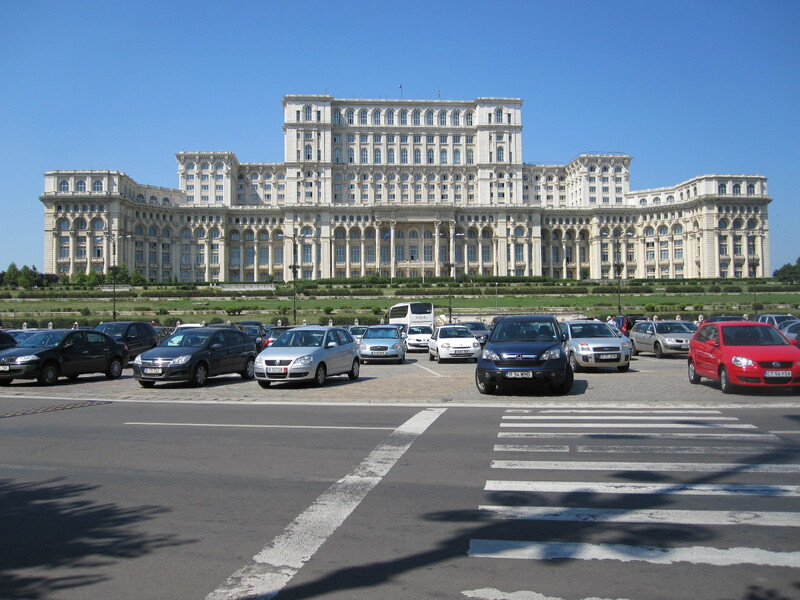 The plan was to fly from Heathrow to Bucharest and stay in a hotel near the airport for two nights, to spend one day looking round the capital and then hire a car on the second morning and set off northwards to the mountains and Transylvania. 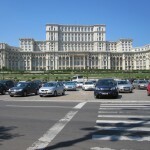 For information I was using the Lonely Planet Guide to Romania, hereafter referred to as LP. The evening before my flight a friend who travels a lot told me on the phone that I was bound to forget to pack something. I assured him that I had a perfect system, with check lists, and I never forget anything. It was rather annoying, therefore, when I realised on the way to the railway station that I had not shaved, and furthermore I had forgotten to pack my shaver. Fortunately I had just enough time to rush to Wilkinson's before getting on the train and buy a Braun Mobile shaver, something that I should have done long ago. Otherwise the journey went well until I arrived at Bucharest airport at 10.00pm, and as the hotel was about a mile from the airport I had to get a taxi. There were taxis lined up in front of the terminal, but they did not want to take me, apparently because they were waiting for people who wanted to go the 10 miles into the city. A man standing nearby said "They won't take you, you need to get one of the taxis over there", pointing to the other side of the car park. I discovered later that this was also the advice given by LP. When I got to the other side of the car park a taxi stopped in front of me and I told the driver where I wanted to go and asked him how much it would be. He didn't tell me, but bundled my luggage in the car, and we raced off to the hotel, which was nearer than I thought. He took my luggage out and when I asked him how much he said "200 lei". £42.50!! For less than one mile! I was so angry that I refused to pay, and it developed into a stand-up argument in front of the hotel, during which I noticed that on the side of the taxi was painted '1.39 lei/km'. When I pointed that out he said "That's just in town". Eventually I gave him 100 lei, which was still far too much, and he jumped in the taxi, shouted "F*** You" and raced off. A good introduction to Romania. The Hotel RIN Airport 3 was better than I had expected, with a decent room and good breakfast the next morning. 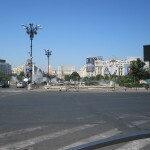 As usual in such places, all advice was not to drive in Bucharest, which was why I decided to go into the city using public transport and pick up the car the next day at the airport. It was about 9 miles to the city centre, and there was a bus stop near the hotel, but you had to have an electronic swipe card to use it, and the nearest place to get that was the airport, so I had to go there on the hotel shuttle. The swipe card cost the equivalent of £2.27, and the lady said it would last for four years, by which I assume that she meant that it could be topped up for four years. I hardly think I could get four years' bus travel for £2.27. 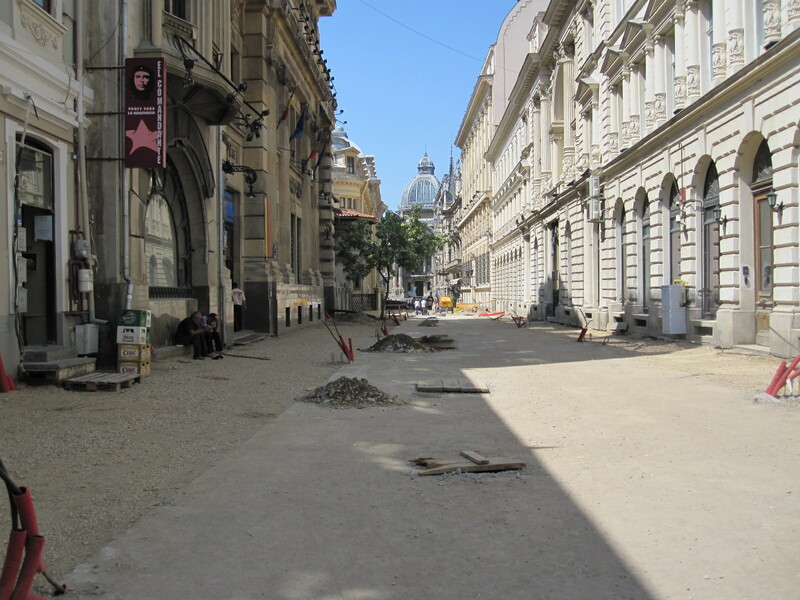 My first impressions of Romania were very different from what I had expected. The road from the airport to the city was like an American urban highway, 3 lanes each way, lined with businesses and with lots of new cars tearing along (much faster than in the USA), including Mercedes, BMWs, Audis etc. Next to the hotel was a Ferrari dealership, and on the way into town we passed Lotus, BMW, Mercedes, Land Rover and many other ultra-modern car showrooms. Overall the traffic was not heavy, and there were only brief hold-ups, again contrary to what I had expected. It was a Tuesday, but perhaps there is an August effect, with people on holiday, which itself would suggest a measure of prosperity. The weather was very hot, around 35ºC (95ºF), not ideal for wandering around a capital city, and I soon found myself consuming drinks and ice cream at a great rate. 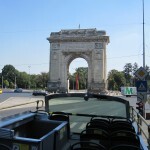 The bus went to a vast square at the boundary between the old and 'new' areas of the city. 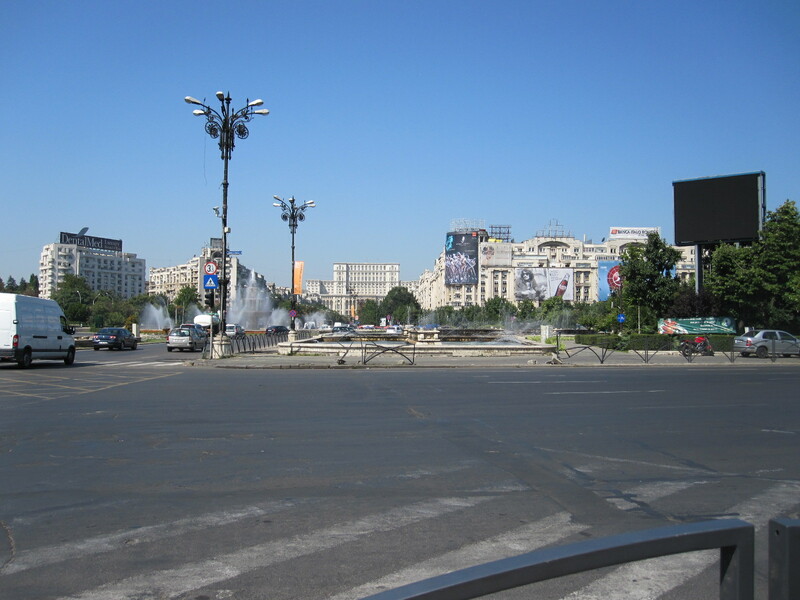 As part of his reforms Ceauşescu demolished about one sixth of the old city and built an enormous palace with an avenue leading to it to rival the Champs d'Elysee in Paris. The palace is the second or third largest building in the world, and the avenue is lined with what are supposed to be imposing buildings and hundreds of fountains. There are very mixed opinions about the architecture, which incorporates traditional Romanian features but has a somewhat sterile look about it, like the pastiche Disney or Las Vegas structures. Like all dictators, Ceauşescu liked balconies, and he had several thousand to chose from when he wished to address his adoring subjects. Whatever you think about the architecture it cannot be denied that it was an amazing feat of construction. 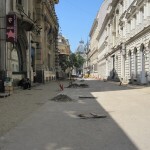 Many of Bucharest's original fine buildings were destroyed by a combination of the Second World War and a major earthquake, and the city is not noted for its sights. The older part was, however, bustling with activity and there was a lot of building work in progress everywhere. There are still some interesting old buildings mixed up with new ones in a way that to my mind is not entirely successful, but I am not considered to know anything about town planning. I followed the walking tour recommended in the LP Guide, and although it referred to some crumbling and derelict areas I did not think it was too bad and there were few signs of real poverty. At least it was possible to walk around and sit down to enjoy an ice cream without constantly being pestered by beggars, unlike some places I have been to. There were a lot of English language signs and adverts around, and I found that most young people could speak English without hesitation. Everywhere you look there are well-known German and American business names and the whole place seems to be quite westernised. 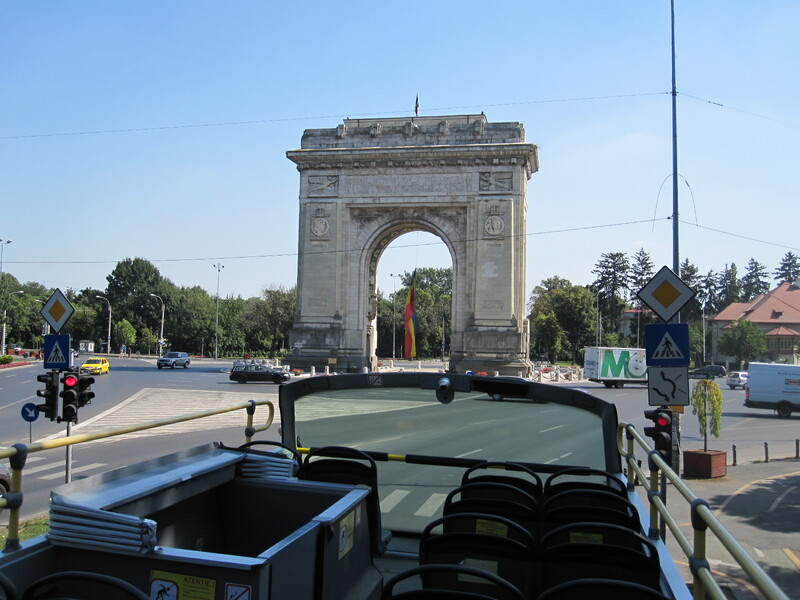 Eventually I couldn't walk any further and took a City Tour on an open-topped double-deck bus, which took a long route to the north of the city and back. Due to the strong sun and the wind I had to wear my baseball cap with the peak at the back to prevent it from blowing off, so with my sunglasses I sat there looking like a Mexican teenager. The most outstanding building that I had not already seen was the Triumphal Arch, a copy of the one in Paris and built in 1935, so it saved Ceauşescu the trouble of building one. Of course, City Tours always go to the nice bits. Perhaps I should get a bus and start running tours of the hideous blocks of flats, the derelict factories and the orphanages. The overall impression that I got was that the city is thriving. From the large number of recent cars, many of them expensive German ones, it is clear that money is somehow finding its way into people's pockets. There were also a significant number of high-powered sports motor-cycles which indicates that some younger people (or their parents) have high disposable incomes. Others are not so well off. At one point I went into a KFC for a snack (don't usually, but it was easy) and left a few chips and part of my "sandwich". As I got up to go a tidy-looking young man at the next table looked across and said "Ah, chips", and moved into my place to finish what I had left. In the evening I had a meal in the hotel restaurant and was slightly puzzled by an item on the menu described in English as "Outlawry Chump (for two persons)". As I was only one person I did not have the opportunity to sample it. The next morning I got the shuttle bus to the airport to collect my car. When the man from Budget Car Rental took me to it I laughed. 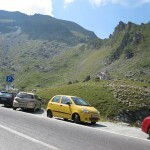 It was a bright yellow Chevrolet Spark, a reincarnation of the 3- cylinder Daewoo Matiz and I don't think it was quite what Jeremy Clarkson would have in mind for storming the Transfăgărăşan Highway. 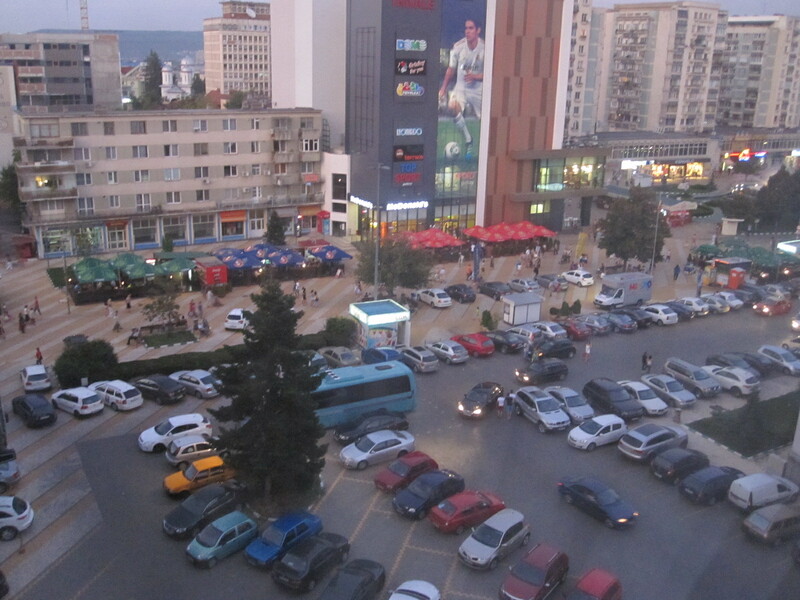 According to all reports it would take several hours to drive over the mountains, so I decided to stay for the night at a town called Pitesti near the southern end of the road. There was a fast road to Pitesti, but as I had plenty of time I thought it would be more interesting to go via several other towns on what might be quieter routes. 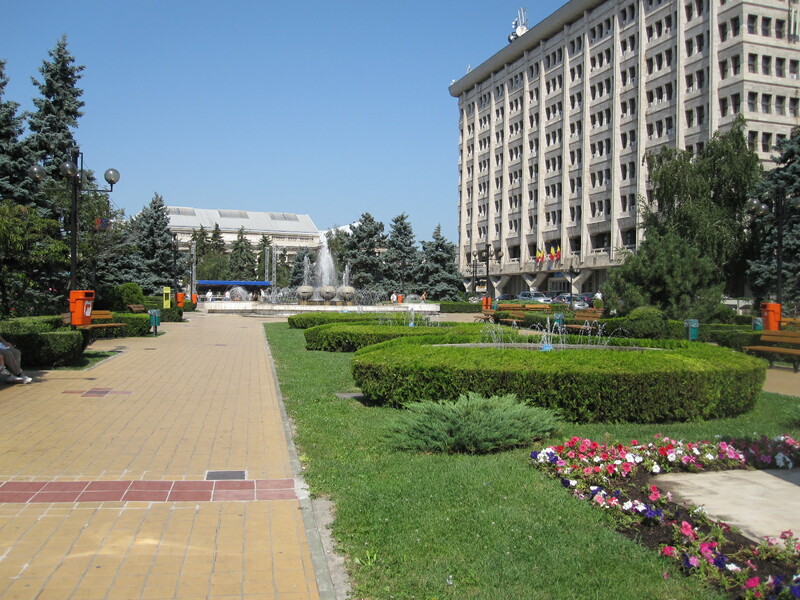 The first of these was a place called Ploiesti, the centre of Romania's oil industry. Until then I did not even know Romania had an oil industry, but apparently the country supplied a substantial part of Germany's oil needs during World War II. 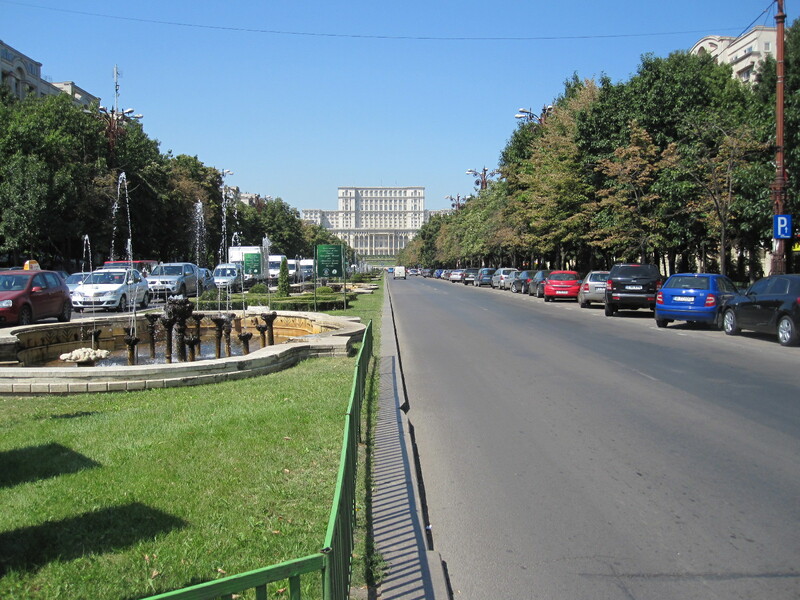 The road to Ploesti was lined with buildings for the entire 40 miles, and this was where I discovered that on main roads between towns Romanians drive as fast as they can, regardless of the many speed limits. The road seemed to be full of German cars and white vans all desperate to get past my little yellow Chevrolet. Ploiesti was quite a pleasant town, apparently thriving like Bucharest, and had an unusual attraction in the form of an oil museum, which I wanted to visit but it was closed. 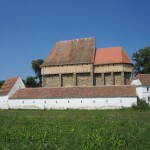 It was too hot for walking very much, so I went across country to the next town, Targoviste. The car had air conditioning, but that was struggling to cope with the high temperature. The road was less hectic than earlier, with more open countryside, although I was disappointed not to see any oil wells. There was not much to see in Targoviste so I went on to Pitesti and parked near the centre while I looked round for a hotel. When I asked a man how to use the parking machine he not only showed me, but insisted on giving me the money (about 11p) to put in it! 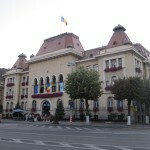 Eventually I found a hotel recommended by LP called the Hotel Muntenia, and got a room overlooking the main square. 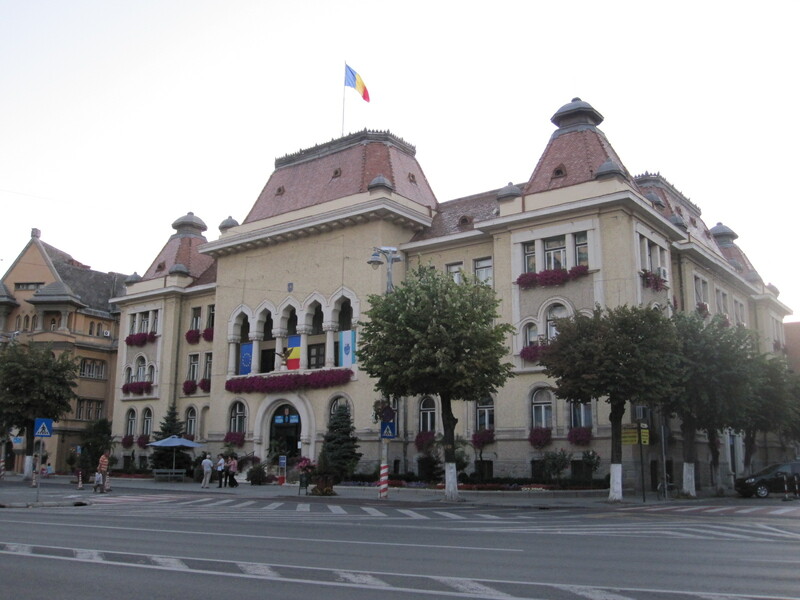 Pitesti is the home of Romania's only car factory, called Dacia (owned by Renault), which is very successful, and again it seemed to be a prosperous place. 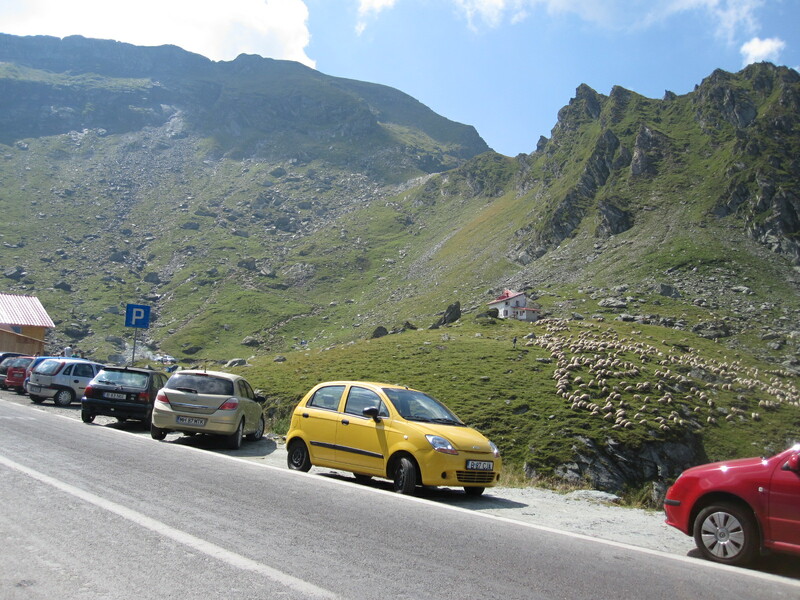 About half the cars on the road are Dacias, and they are sold all over Europe excepting in Britain. 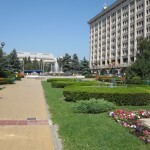 LP said Pitesti had 'energy and a lively atmosphere', and was a good place to stay the night. The square was packed with people sitting outside eating and drinking until late, and then I was kept awake until 2.30am by yobs messing about with car alarms and upsetting the dogs (see later). I suppose this could be described as 'energy and a lively atmosphere', but perhaps someone should remind LP that they are travel guide writers, not estate agents. The buffet breakfast was dreadful, a particularly bad version of the meat, cheese and hard dry bread that seems to be the norm in Europe nowadays. The mountain route actually starts at the southern end from a spa town called Curtea de Argeş, about 25 miles north of Pitesti. At 10.00am on a Thursday morning Curtea was a complete madhouse, and although I would like to have stopped to look round, it was impossible to park anywhere near the centre. For some distance after leaving the town the road was built up on both sides, but then started to climb through open countryside and into the mountains. 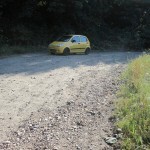 The surface deteriorated into large potholes which cars were steering round, and the pace came down to about 10mph through a seemingly endless succession of uphill hairpin bends. This section of the highway, with its bad surface for miles, demanded so much concentration that it was difficult to look at the scenery. 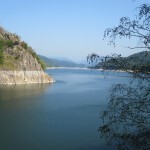 Eventually the road crossed a dam, part of a hydro-electric scheme and ran along the side of the picturesque Lake Vidraru, still in tight bends for a long distance before dropping down and straightening out. The surface then improved greatly and the road began to climb steeply through many more bends, forcing my inappropriately named Spark down to second gear at times. Fortunately there was little traffic on the road, so I did not get wiped out by Jeremy Clarksons with their several hundred brake horse power. Shortly before reaching the top of the pass the road entered an 887m (approx half mile) long straight tunnel through the solid rock of the mountain, leading to what can only be described as a recreation area, with a large car park, souvenir stalls, a burger bar, a restaurant, and a lot of people. Bearing in mind how little traffic there was on the road it was hard to see how they all got there. The cable car from the valley below did not seem to be in operation and there is no public transport. Above the car park, to the right, was the amazing Lake Bâlea, described by LP as hovering like a mirror among the rocks. From there the road zigzagged downhill with sheer drops on one side for much of the way, but fortunately I could not see them because I was on the side against the rock face. In several places there were viewpoints from which the road could be seen snaking down into the valley with a mind-boggling number of hairpin bends. The scenery in the valley was beautiful, with some waterfalls tumbling down the rock faces not far from the road. In its entirety the route is like two mountain passes in succession, the northernmost one being higher and better surfaced. In some respects it is not as spectacular as many of the Alpine passes, because the adjacent mountains, at about 2500m (8000ft) are nothing like as high as the Alps, and the main pass itself is only just over 2000m (6500ft), which is lower than almost all the well-known Alpine passes. 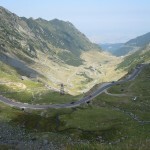 However, at about 50 miles the overall length is much longer than any Alpine pass, and the number of bends is far greater, which makes for a better driving experience. Transylvania, which some people think is not a real place, occupies a large area of central Romania, and the part north of the mountains I had just crossed is known as Saxon Land, because it was colonised by Saxons from the 12th century. They put their stamp on the towns and villages, which have a distinctive German character and are very attractive. Few Germans live there today, but many visit to experience Germany as it used to be. The nearest town after the mountain pass was Sibiu, reached via a main road with frantic traffic, an unpleasant drive compared to most of the day so far. On the outskirts of Sibui I found a motel called the American Inn, which was like a prop from a Disney film set. 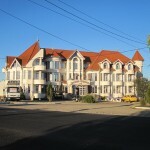 The Americans have no idea of inns (think of Holiday Inn) and the Romanians have no idea of American inns. Anyway, it was cheap and clean, though the room was small. Opposite to the motel was a huge retail park, somehow not the sort of thing I expected to find in Transylvania or anywhere else in Romania. I walked into the town, about 2 kilometers, along a busy road lined with uninspiring buildings until I came to the centre, which was a revelation. 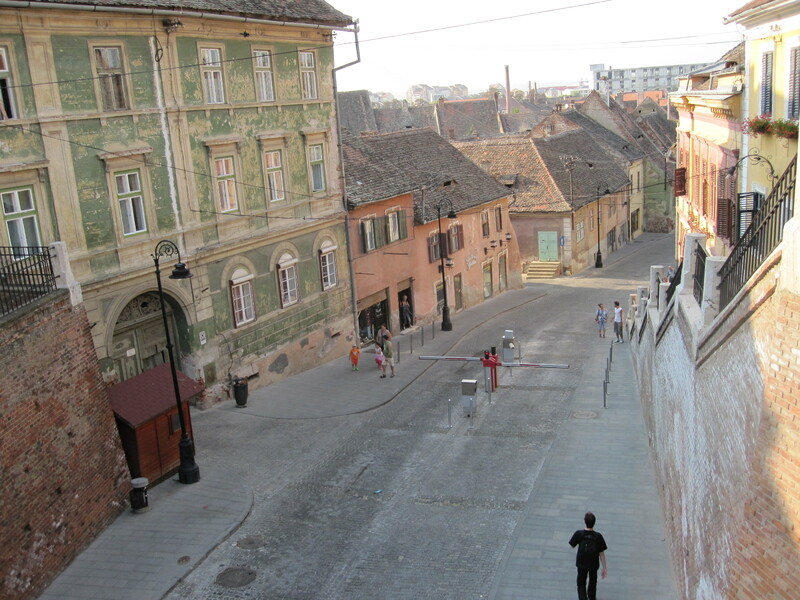 In 2007 Sibiu was the European Capital of Culture, and was given a makeover at great expense. Normally I avoid such places, because usually they are an excuse for local dignitaries to spend other peoples' money ruining the place for a few moments of glory, but although the main street has been somewhat sanitised the rest of the central area is unspoilt with rough cobbles and genuinely ancient buildings. The next day, after an awful breakfast, I set off across country on minor roads for Sighisoara, another noted Saxon town to the east, and the birthplace of Vlad Tepeş/Dracula. After a few miles the road ran through a wonderful village called Altina, which was exactly how I imagined a Romanian village would be. The main street was lined with old detached house, painted in pastel colours, and I stopped and went for a walk though the back lanes. These were all unpaved, with a surface of grass, earth or gravel, probably turning to deep mud in the winter. Seen close up, many of the houses had dates on them, and were not as old as they looked, having been built in the 1950s. There were not many people or cars around, but a few tractors and horse drawn vehicles piled high with the produce of the harvest. 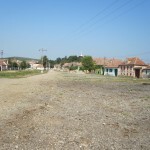 It is tragic to think that dozens of villages like this were destroyed by Ceauşescu in the course of his rural reform programme. Saxon Land is noted for its wonderful fortified churches, found in towns and villages throughout the area. The churches were surrounded by high walls in the 15th and 16th centuries to defend them from attack by Turkish forces, a measure that was obviously successful because they are still there today. 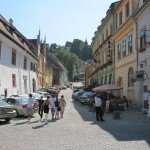 Sighisoara, Dracula's birthplace, has everything. A river, a citadel, cobbled squares on different levels and is packed with ancient buildings. It is, however very touristy, even on a weekday. From the citadel a wooden covered stairway with over 200 steps leads up to a church on a hill above the town, but the effort is not very rewarding because there is only a limited view through the trees at the top. 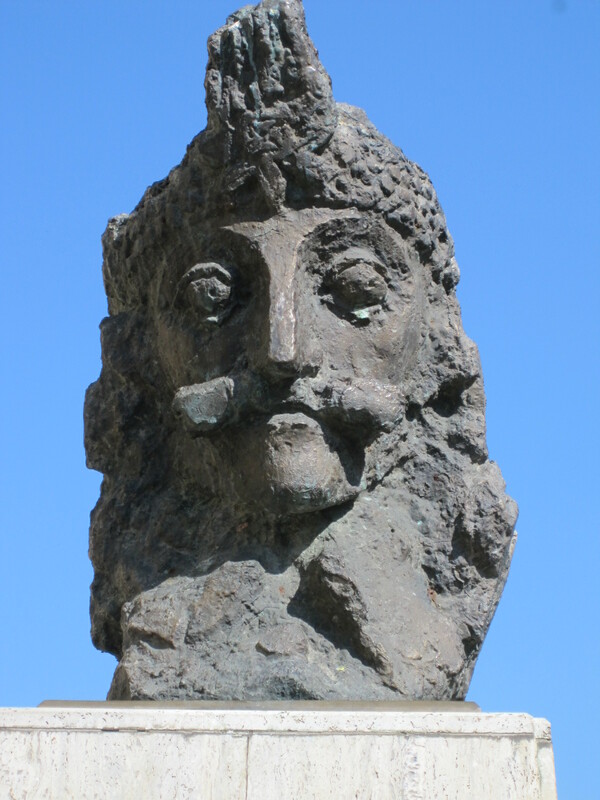 Tucked away behind another church is a stone bust of Vlad Tepeş with an expression suggesting that he is looking for someone to impale (picture at start of story). Having seen a few nice places I thought it was time to move back into the real world, and decided to go on to an industrial town called Mediaş to stay for the night. After booking in at the excellent Edelweiss Hotel (112 lei = £24) I went for a walk and was surprised to find a well-preserved old-town area in the centre, and strangely, a vast vegetable market that was closing down at 7pm. It consisted of a massive indoor hall surrounded by outdoor stalls, and it is difficult to understand how the town could support such a large market unless people travelled long distances to it. There was a lot of unsold produce which would surely be wasted unless the market was open every day. At breakfast time the next morning I found myself sitting at a table with two elderly German couples who were driving home after going to Turkey. We compared notes and agreed that there were many things that were hard to explain in Romania, one being the reason why we had been seated as far as possible from the buffet when there was a similar table close to it. My theory was that it was so that every time you wanted to top up you would have to walk the length of the room in front of the staff who were standing around doing nothing, which might deter you from taking too much food. It would take a lot more than that to deter me when there was free food in the offing. The Germans commented on the aggressive driving, and were rather upset because they had been fined for speeding in a place where all the local drivers were overtaking them. They were also using the LP guide, but I don't know whether it was in English or German (LP is a branch of the BBC). From Medias I went a few miles down the road to Copsa Mica, described by LP as Romania's ugliest town. It seemed to consist mainly of the blackened shells of derelict factories, and as always in such cases, you have to wonder what the people do now. 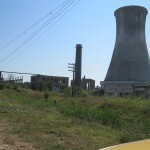 There was little sign of any new industry, although LP said some of the old factories were still working after being fitted with Euro-standard filters. 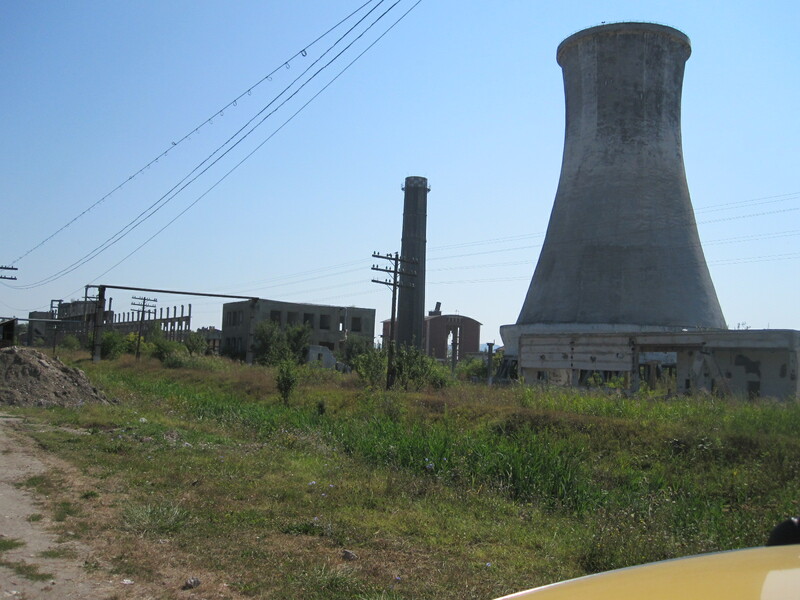 Blaj, the next town, while far from beautiful, had a quite a lot of cleaner working factories, and was a tidy place. It has a relatively high Roma (Gypsy) population and within a couple of minutes of getting out of the car I was approached by someone apparently begging, the only time this happened in Romania. Perhaps I am jumping to conclusions, but the Roma are said to be treated as an underclass in Transylvania and subjected to racist abuse. Not long afterwards I had trouble with two young children who started opening the car doors while I was waiting at a level crossing out in the countryside, and one of them spat on the car windows when I refused to give them anything. Nice. It was now Saturday, and it was part of my plan to visit a gorge and a salt mine near a town with the attractive name of Turda. There was a festival on in the town, and when I eventually got to the salt mine there were so many people that I decided to give it a miss. One of the problems of going in August. To make matters worse the gorge defied all my attempts to find it, so I set off on a cross-country route to Targu Mures. This is where I really found out about Romanian roads. Before the trip I had bought a new Michelin map of the country with a scale of 1:750,000 (12 miles to the inch), which should have been adequate for what I was doing, but I had long since discovered that the representation of a road on the map bore little relationship to what was on the ground. Many roads, major or minor, are well-surfaced but the condition of any road, at any time, can suddenly deteriorate into a mass of potholes or a rough track, and all level crossings have to be taken at a crawl. A fair proportion of minor roads between villages are unpaved, and the map was supposed to indicate these with dotted lines, but very few were shown as such. The route to Targu Mureş started with a stretch of main road and then tarmac country lanes, through several villages exactly as shown on the map. After about 10 miles the tarmac suddenly stopped at the top of a hill, leaving a rough, fairly wide track through woodland. I knew I was not far from a village called Papiu Ilarian (don't ask) and decided to carry on down the hill, in the hope that the tarmac would restart in the village. 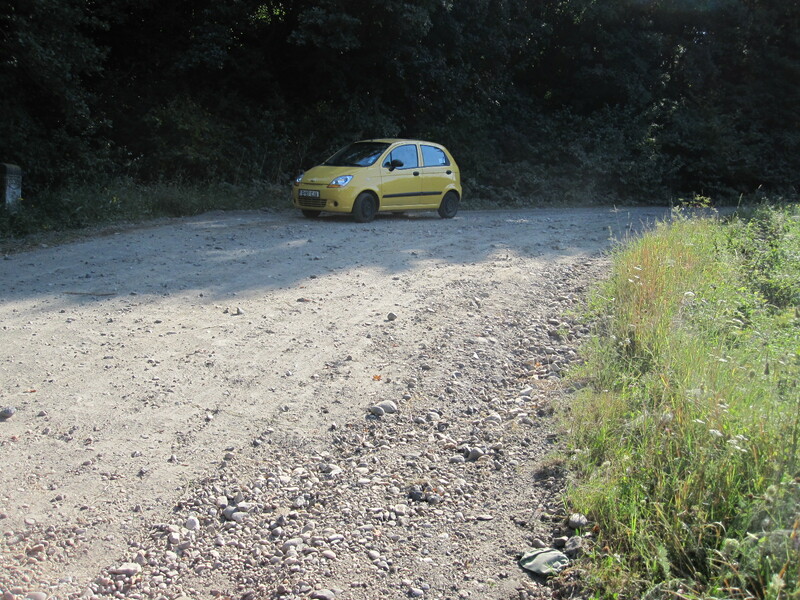 It did, so I thought it would be tarmac for the remaining 20 miles to Targu Mureş. What happened? Just as I got to the far end of the village the tarmac stopped in a line across the road, and I found myself facing a choice of two gravel tracks with no signs. Looking at the map it was obvious that this situation could recur over and over again, so the only thing to do was to go back to the main road. Cuba all over again. The next day I had a similar experience on another cross-country route, when a wide tarmac road with a white line along the centre suddenly turned into a narrow rough track on top of a hill in the middle of nowhere. It was hard to understand how at sometime a tarmac machine had been up the hill, followed by a white lining machine, and then it all came to nothing. The rough track seemed to go on indefinitely, so I turned back and found another way. There was little traffic on any of these minor roads, with horses and carts being the staple transport for many people. To the north-east of Saxon Land, still in Transylvania, is a region occupied largely by people of Hungarian origin, known as Szekely Land. Romania is bordered on its western side by Hungary, but Szekely Land is like an island in the middle of the country. Ethnic Hungarians are in the majority in some of the towns and the Hungarian language is widely used. 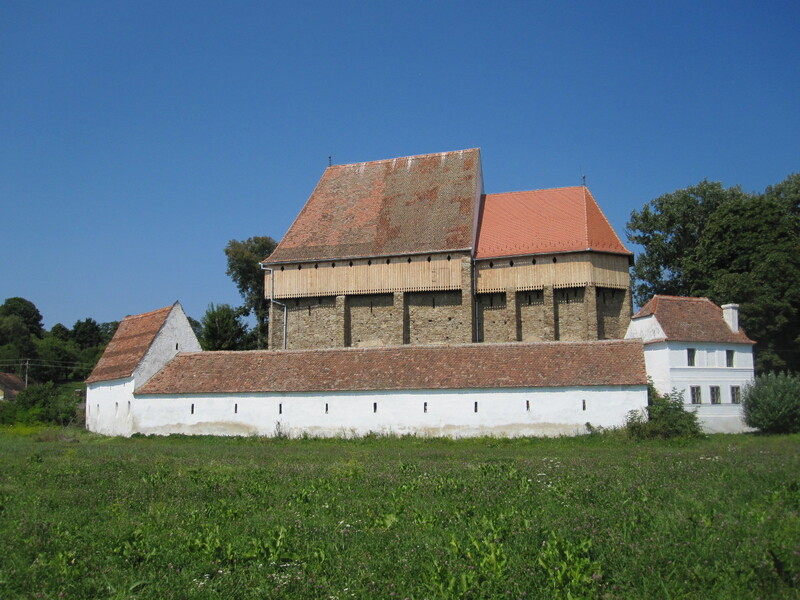 As with the Germans and Saxon Land, many Hungarians come to Szekely Land to experience Hungary as it used to be. 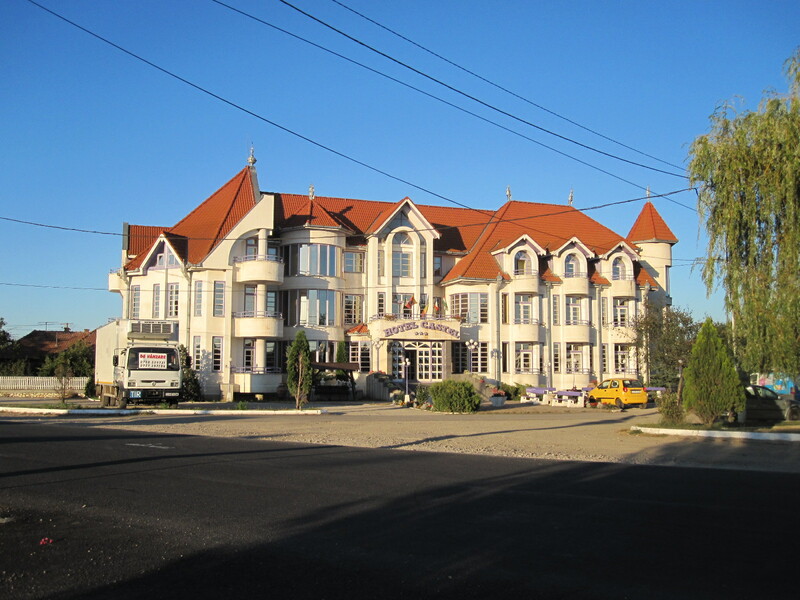 On the hectic main road into Targu Mureş there was an advert for a hotel at about £11 a night, which would be the lowest I have paid for a long time, but when I found it there was a wedding reception on and it was impossible to get near the place. Whether it was the time of year, or whether it is always the same I do not know, but there seemed to be weddings on everywhere, with long lines of cars driving around towns blowing their horns in celebration. Apart from weddings, there were also parties and carnivals going on all over the place. The Romanians appear to know how to enjoy themselves. Shortly afterwards another hotel came into sight, the Hotel Concrete. Thousands of people have stayed in the Ritz and the Savoy, but how many people can boast of having stayed in the Concrete? Well, I can. It turned out to be the head office of the pre-stressed concrete company that built it, and was quite good, presumably because they use it to demonstrate their product. The population of Targu Mureş has a roughly equal split between Romanians and Hungarians and the town has been the scene of serious racial tension in the not too distant past, but it was calm enough while I was there. 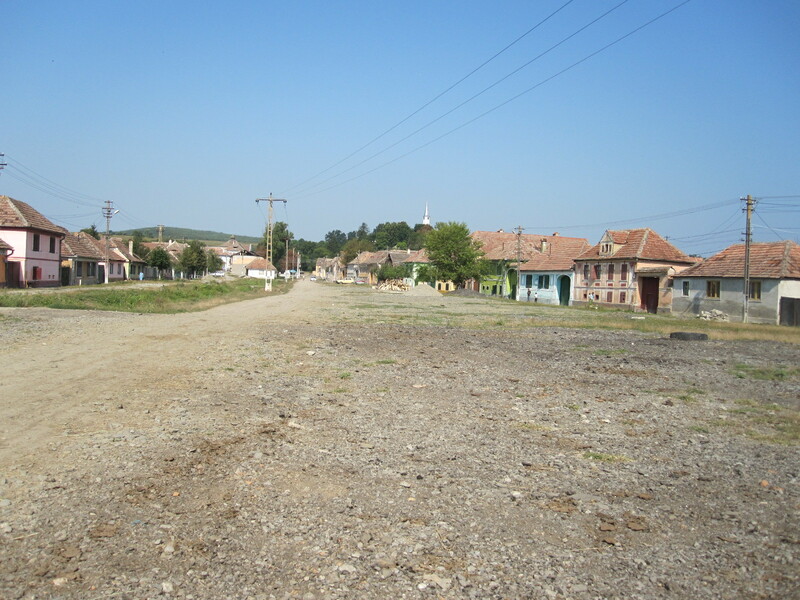 The outskirts were industrial, but like most other Romanian towns the central area was quite pleasant. Driving down a hill on the way out the next morning there was a view of the most astonishing vast estate of grim Soviet style flats that I have ever seen, but unfortunately I could not stop for a photograph. 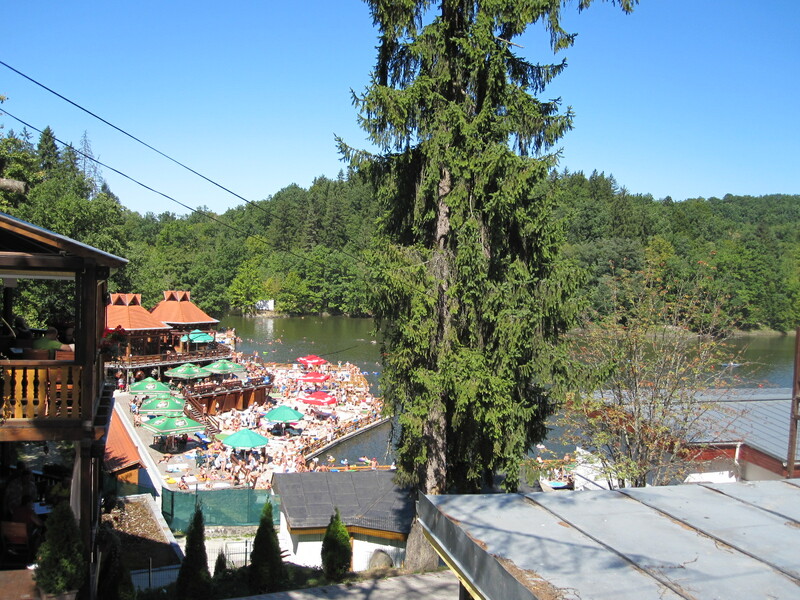 After one of the challenging cross-country journeys described above I came to Sovata, a really thriving spa town with what is said to be Europe's biggest heliothermic lake in the centre. 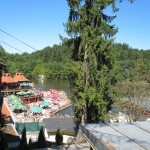 The weather was still hot with unrelenting sunshine, so the lake was working well, with hundreds of people on its shore. Having failed to get to the salt mine at Turda I was hoping to visit the one at Praid, not far from Sovata, but it was the same story again. It was Sunday, about midday, and I was not prepared to dedicate most of the rest of the day to getting into the mine, so I drove on to Odorheiu Secuiesc and Miercurea Ciuc, two very Hungarian towns with names that the people who live in them can pronounce without difficulty. 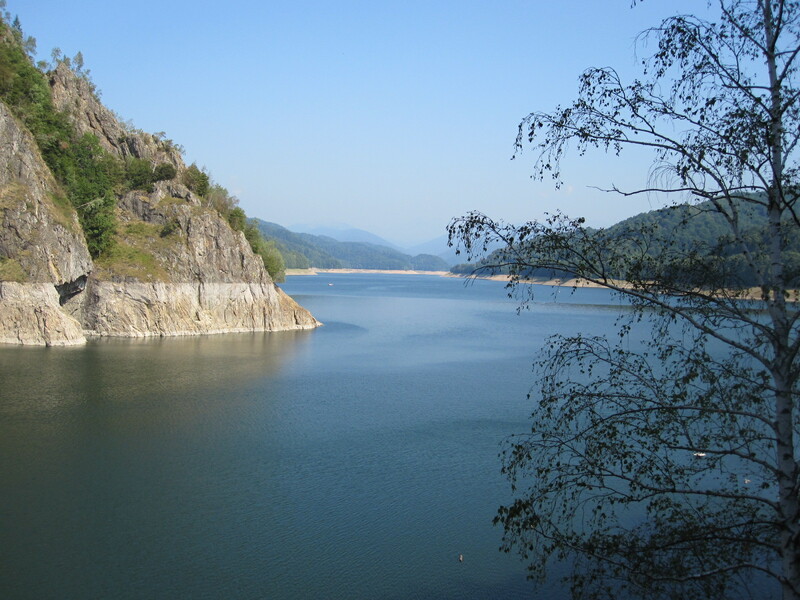 Odorheiu Secuiesc was a pleasant place, but did not have the sort of character of the Saxon towns, and Miercurea Ciuc seemed to have only just emerged from the Soviet era, having been given the Ceauşescu treatment. The countryside in this region is very attractive, with rolling hills, woodland, and pretty villages. 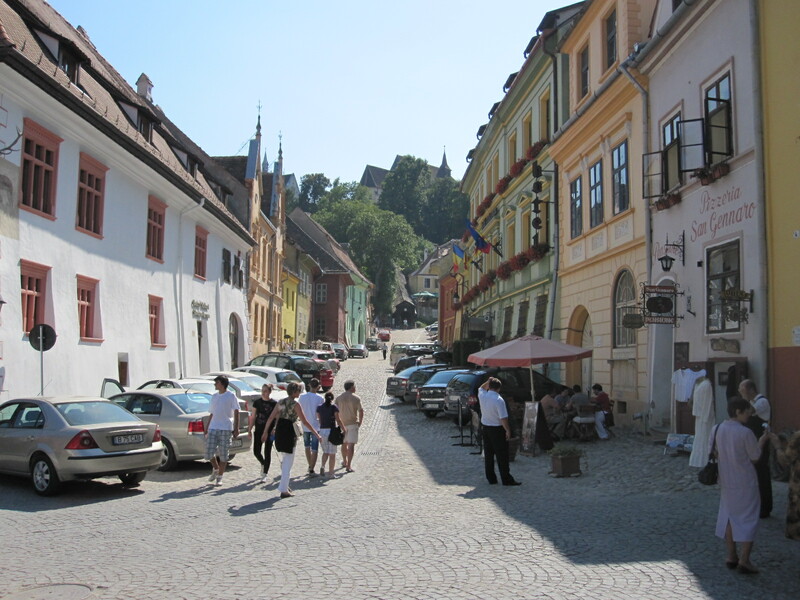 The next day would be my last in Romania, and I particularly wanted to see Brasov, so I took the main road southwards from Miercurea, which was extremely slow going due to heavy traffic combined with roadworks with long hold-ups, not helped by the usual mad drivers. On entering Sfântu Gheorghe, a town some distance before Brasov I came across the quite imposing Hotel Castel, with slightly over-the-top gothic/baroque architecture combined with a purple and white colour scheme which I felt should help to keep the price down. It was certainly moderately priced and by my standards good, with a restaurant in a separate, matching single storey building. On the breakfast menu here was another mystery item, described in English as "Brown File", so perhaps they were expecting Monsieur Mangetout, the Frenchman who eats everything. In the middle of the night I was woken by an extremely violent dog fight in front of the hotel, the canine equivalent of the cat fights at home, but with more and larger participants. This brings me to a subject that I would rather avoid, but it is so much part of Romania that I cannot do so. In the 1980s when Ceauşescu was carrying out his reforms large numbers of people, both in towns and countryside, were evicted from their homes at short notice and rehoused in the lovely new blocks of flats that were being built. They could not keep their dogs, and most were simply turned loose to fend for themselves. Their descendents are now living wild all over the country, and there are said to be over 100,000 in Bucharest alone. There are stray dogs everywhere, and many are killed on the roads. I saw at least 6 dead ones on one day, which is very distressing, but the consolation is that they are not people's pets. You cannot risk getting involved with these dogs, because rabies is endemic in Romania. The Romanians seem to accept them as part of the scene and in towns I think some people feed them. Animal rights organisations want the government to instigate a neutering programme, but the government favours just putting them down. There is no easy or kind answer to this problem. Of course, many people still keep dogs as pets in the normal way. A few miles south of Sfântu Gheorghe, Brasov is the second largest city in Transylvania and justifiably renowned for its beauty and fine buildings. Car ownership is still low enough for it to be easy to find a space near the centre at 11am, although you have to pay, and the first thing I noticed on getting out of the car was the word BRASOV high up in the trees on Mount Tâmpa, just like the famous HOLLYWOOD sign. 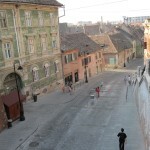 A large part of the central area is surrounded by an ancient wall and has been restored to a high standard. The main square has a grim history with the last witch burning in Europe and plenty of tortures in the tower but it all seemed very peaceful when I was there. 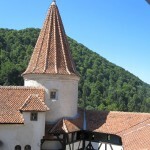 About 20 miles from Brasov is the village of Bran, with the incorrectly named "Dracula's Castle". 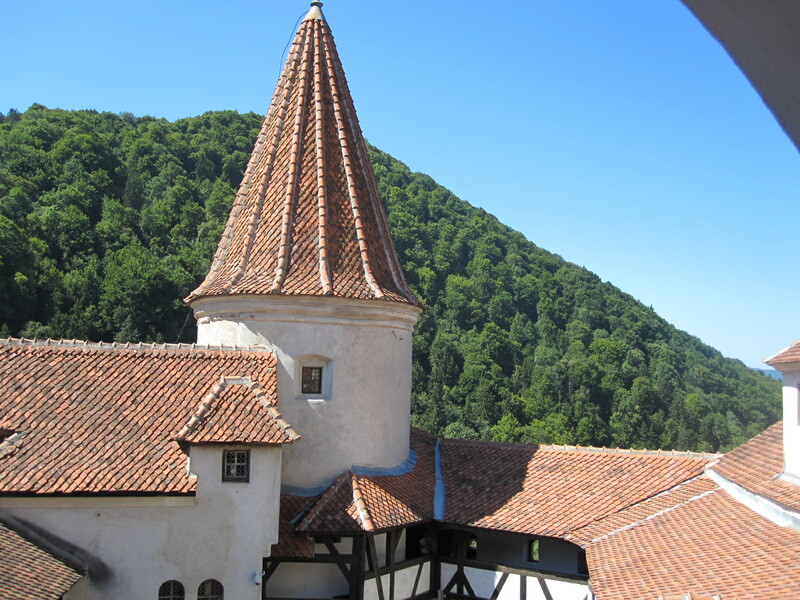 As long as you are aware that the connection with Dracula (and Vlad Tepeş) is totally fictitious it is quite good fun, with its turrets, galleries, and winding staircases, but the guide book didn't mention the giggling teenagers everywhere. It did mention the souvenir stalls and car parks that occupy most of the rest of Bran, but there is also a more serious attraction in the form of a village made up of genuine ancient buildings that have been saved from destruction elsewhere. It was then time for the hectic drive back to Bucharest and the Hotel RIN Airport 3, ready for my flight home the next morning. Romania was not what I had anticipated. There are, inevitably, 'haves' and 'have nots', with a big difference in lifestyle between town and country, but the proportion of 'haves' was much higher than I expected. According to EU officials in Brussels there is a high level of corruption, and they should know because they are experts at it, but it is not obvious to a visitor. There is a lot of foreign investment, especially from Germany, and many of the banks, food stores and DIY shops carry well-known German names. People seem to work quite hard, but from the number of new cars and motorcycles on the road, including expensive ones, it is producing results. Some of the notorious orphanages for abandoned or handicapped children, a legacy of the Ceausescu period, still exist but they are said to be fewer in number, with improved conditions. Away from the 'international traveller' environment around the airport most things, including food and hotels, were much cheaper than at home. Petrol comes out at about £1.15 per litre. 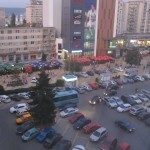 Foreign tourists are quite thin on the ground, although it is no doubt a different matter on the Black Sea coast. During the whole trip I saw only one British registered car and came across no other British people. Although cars are driven very fast and apparently recklesslyI did not see a single accident in 850 miles, and the general standard of discipline is better than in Albania or Russia, for example. In southern Spain almost every car is scratched or dented, whereas in Romania most cars are in good condition, apart from old Dacias. 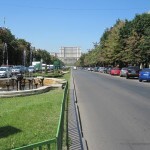 In many former east European states car crime is a serious problem and cars cannot be safely left in the street. Hotels have guarded car parks, often with big steel gates, but in Romania such precautions do not seem to be necessary. At this stage the country is not on my 'must go again' list, but I came away feeling quite optimistic about it.